The keywords from your ‘Campaign keyword list’ ordered by growth potential. Keywords that ar on the verge of getting a top ranking AND that have a good growth potential for getting extra traffic get top rankings in this report. Typically these words rank near position 5 and have a decent amount of extra traffic, so a small increase in rankings can generate a huge step in number of visits. 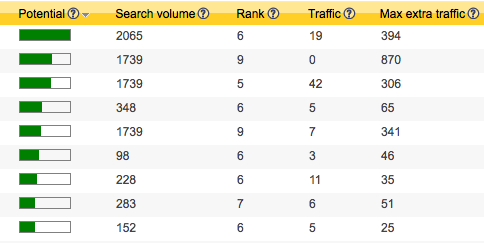 Check the top ranking pages for those words with the page scan and get cracking with a focussed links strategy. This SEO report works best in a campaign with 100 or more keywords and a site that attracts some serious traffic. You can now track SEO Effect’s rank tracker on the go! Thanks to the excellent Status board app from Panic. That app allows you to create your personal dashboard with input form SEO Effect (and many other sources too). You can get up to 8 campaigns in one dashboard. Open the reports tab on the browser, choose the “iPad dashboards” submenu and click on the link. We start off with a ranking dashboard that shows you the number keywords that rank 1st place, top 5, page 1 or page 2 and up. These are cumulative numbers, so a top 5 ranking is also counted as a page 1 and page 2. Similar to the graph you find on you rankings report in the SEO Effect Memberzone.